Altair Aerial made their name with drones that were aimed at beginners, emphasizing their ease-of-use features and the company’s customer service guarantee. Now they’ve released the Blackhawk, a drone that’s built for speed and distance and aimed at, in their own words, “a more advanced level” of drone pilot. The focus here is less on intuitive controls and more on providing a drone that has high-end features at a low price. To facilitate this, Altair has removed the camera and replaced it with a mount that’s compatible with an action camera (such as the GoPro Hero line) which you have to purchase separately. This can actually give you better photos and videos than most built-in cameras…but, of course, it comes at a higher price when you put it all together. So the question is: is the Altair Blackhawk fast enough, fun enough, and overall of a high enough quality to make up for the features it lacks? In my opinion, the answer is a resounding yes. Altair also recently released the Tomahawk Drone – read our review here! If you’re looking for an advanced drone that will cost you very little, or if you already have a GoPro and want to take it to the literal next level with aerial photography, the Altair Blackhawk is the best budget long-range drone on the market and a great choice for any consumer. Right out of the box the Blackhawk can be a little intimidating because of its size and the amount of assembly required to put it all together. 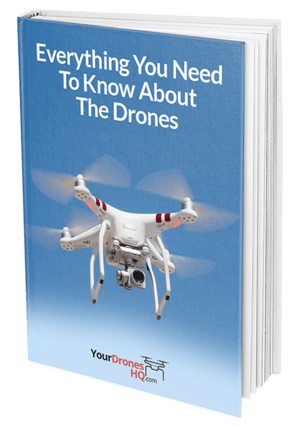 However, there’s nothing here that will surprise you if you’re an experienced drone user – the instructions are very helpful and all it takes is a little time with a screwdriver to attach the propellers and the prop guards and the landing gear. It took us about 15 minutes altogether. Once it’s been built and you’ve charged the batteries, you should be ready to go! The Blackhawk doesn’t require any fiddling around with smartphones or mobile devices – it’s controlled from a single remote with two sticks and a lot of fine-tuning options for adjusting the trim and control of the drone. If you have a seperate camera (Altair recommends the GoPro Hero line but any similarly-sized action camera should work) you can attach it to the mount, though there’s no way to control the photography/videography from the remote. There’s not many particularly fancy features here (though there is a dedicated button to let you perform 3360 degree flips) but the Blackhawk is a lot of fun to fly. Its solid metal body and powerful brushless motors means that it can be pretty effectively flown in winds of 10-15 mph (which is something previous Altair offerings couldn’t handle at all) and on a clear day you can pick up a pretty impressive amount of speed. At times it actually feels like a racing drone. The controller’s a little difficult to get used to at first but it provides a sense of total control thanks to the aircraft’s 6-axis gyro. All in all this drone is extremely enjoyable to fly and a perfect choice for hobbyists who want to take their piloting skills to the next level. Other reviews for the Blackhawk are mostly emphasizing its long range (300 meters) and its 15-minute battery life, which makes sense because those are the high-end features that make this drone more advanced than Altair Aerial’s other offerings and are two features that are all but unheard-of at a price point this low. A surprising number of the Amazon reviews are from beginners who talk about how easy it was to pick up and fly this drone (which would not what I would have expected, personally.) They talk about the videos that Altair has available to help you set up and fly the drone for the first time as well as the company’s helpful customer service (which is something they’re known for). However, some people made note of its lack of an Altitude Hold mode, which the other two Altair drones have and which can make it much easier to fly a drone because you only have to think in four directions instead of six. The Altair Blackhawk is a slightly advanced drone. It doesn’t have too many fancy features and beginners shouldn’t have too much trouble with it if they follow the instructions, but you might lose a propeller or two in some early crashes (fortunately, there’s lots of extras included and you can buy more from Altair’s website.) This is really aimed at pilots who want high-end drone functionality at a budget price. If you’re just flying this drone for fun, the Blackhawk has everything you need right out of the box for only $124 USD (at time of writing). If you want to take pictures or video, you’ll also need to buy an action camera. The mount provided is specifically designed for the GoPro Hero 3 or 4 – you can find the former for about $70 USD and the latter for about $160 USD. If you buy the former, you’ll have a very good opportunity for some aerial photography for less than two hundred dollars (which is not bad at all) but if you’ve got money to spare the latter has a lot more features and is better overall. Like other Altair products, the Blackhawk has good customer ratings on Amazon and is backed by the company’s reputation for good customer service. You can purchase the drone at the best price with free shipping from Amazon. Drones – especially higher-end drones – can often seem inaccessible to regular consumers. Dropping a thousand dollars on the latest DJI line is one thing if you’re a professional photographer, but what about us regular folks who just want to get in on the cutting edge of technology? And if you do find a good, cheap drone, they’re usually dumbed down products aimed at first-time fliers. That’s what makes the Blackhawk special. It’s incredibly cheap at only $130, but it’s the best long-range drone available for the budget. It’s solid, it’s fast, it’s fun-to-fly and it’s perfect for recreational use. And if you’ve already got a GoPro, well, then this is a no-brainer.